That’s why the Vetanswers’ tag line is…save time, connect & discover! Because that’s exactly what we do! Why did I set up Vetanswers? Because I love the veterinary industry and have a lot of admiration for the people who work in it. I don’t know of any other industry where people are so passionate about what they do for, let’s face it, not the greatest of financial returns. People work in this industry because they honestly love what they do. I also believe that the financial rewards for working in this industry should be better and although the vets and nurses who own practices are fantastic at looking after animals, they may not be so good at looking after the business side of their practice. Sometimes this is due to a lack of time or to be honest, a lack of interest. So that’s where I come in – I love research and reading so I track down the best information and resources to share with the Vetanswers Community. 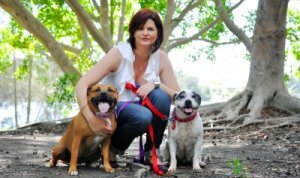 Although I've been working with the veterinary industry for over 15 years, I’m not a vet or a vet nurse….I’m a pet owner (ok – maybe a fairly well informed pet owner) and one of my strengths is that I can speak to our Community as a pet owner – and when necessary I’ll be brutally honest about what I want as pet owner. No matter what you do or where you work, you're welcome to join the Vetanswers Online Community - membership is FREE and always will be.